A black and white photograph of children in the Whitby United Church "Old King Cole" Sunday School anniversary play. 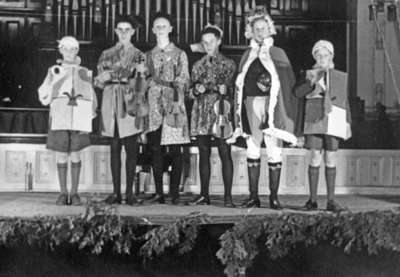 From left to right are: Donald Smith (herald), Howard Clemens, Benny Lynd (fiddler), Jack Whitfield (fiddler) Bill Bull (King Cole), Bob Collins (herald). The Methodist Tabernacle was built in 1875-76 at the south-east corner of Centre and Colborne Streets. It became the Whitby United Church in 1925 and St. Mark's United Church in 1962. Sunday School Anniversary Play at Whitby United Church, May 8, 1938, Marjorie Ruddy. Whitby Archives 09-004-020.